(The Indian Ocean News Letter) - The Somalian minister for foreign affairs, Abdisalan Hadliye Omar, went to Riyadh in mid-July to discuss the Federal Republic of Somalia’s possible cooperation with the Gulf Cooperation Council (GCC) in the ground operation against Houthi rebels in Yemen. This visit comes after the GCC had asked the Saudi government not to receive a Somaliland delegation led by President Ahmed Mohamed Mahamoud, generally known as Silanyo. Officially, Silanyo had planned to go to Mecca on 6 July to pray before the end of the holy month of Ramadan, but more importantly he wanted to draw profit from Somaliland’s participation in the war effort against the Houthis. He is fully aware how much the forthcoming suspension of the US aid – a $100 million programme – will make a hole in his budget. The Somalian central government’s putting Silanyo in quarantine was thus done in concert with the United States, which have repeatedly expressed their frustration at Somaliland’s half-hearted involvement in the fight against AlShabaab radical Islamists. 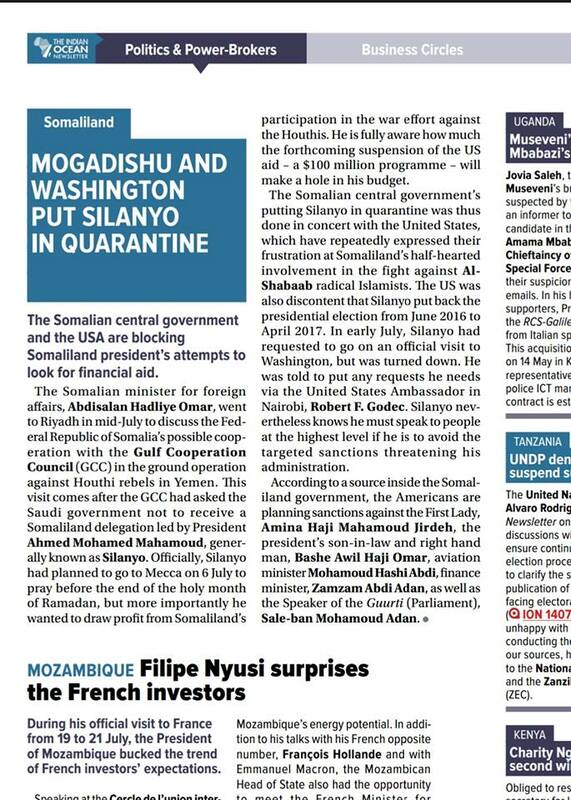 The US was also discontent that Silanyo put back the presidential election from June 2016 to April 2017. In early July, Silanyo had requested to go on an official visit to Washington, but was turned down. He was told to put any requests he needs via the United States Ambassador in Nairobi, Robert F. Godec. Silanyo nevertheless knows he must speak to people at the highest level if he is to avoid the targeted sanctions threatening his administration. According to a source inside the Somaliland government, the Americans are planning sanctions against the First Lady, Amina Haji Mahamoud Jirdeh, the president’s son-in-law and right hand man, Bashe Awil Haji Omar, aviation minister Mohamoud Hashi Abdi, finance minister, Zamzam Abdi Adan, as well as the Speaker of the Guurti (Parliament), Sale-ban Mohamoud Adan.